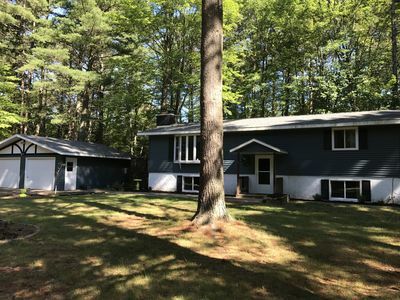 Gresham Retreat sits on 8 very private acres at the end of a private peninsula, less than 80 feet from the shore of beautiful Lower Gresham Lake. 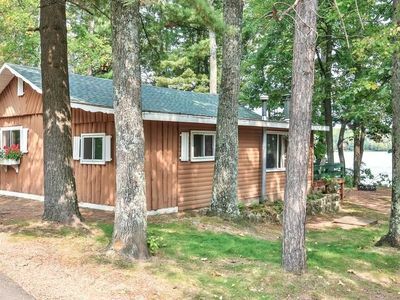 Sitting at the end of the developed side of the lake, the closest neighbor is out of sight over 400 feet through the woods, leaving only serene lake and state forest land in sight. 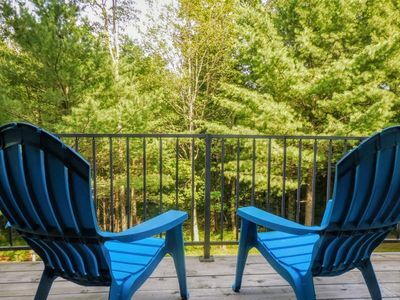 Guests enjoy secluded 180 degree views of the lake, striking sunsets along the 520 feet of frontage, and plentiful wildlife in the adjacent state forest land lining 75 percent of the lake. 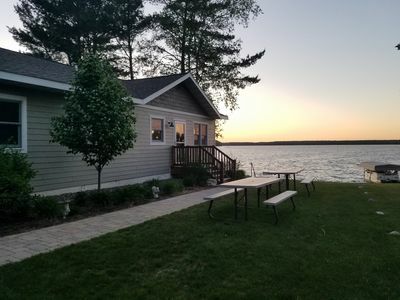 A large grassy clearing provides ample space for the kids to play, while picture windows and an expansive deck allow you to enjoy the lake in comfort. 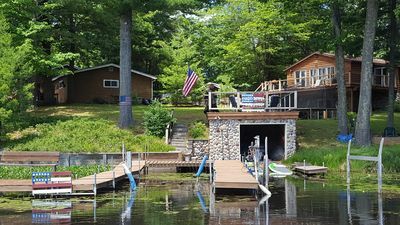 Finally, a scenic lake-side propane grill, picnic and camp fire area provides a peaceful gathering space by the shore for adults to enjoy while the kids enjoy the swimming area, dock, lily pad and watercraft. 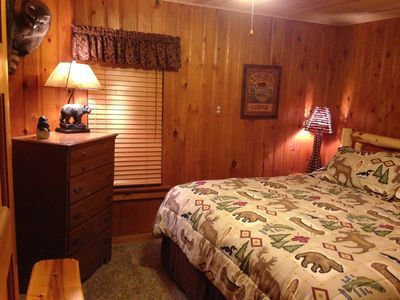 Gresham Retreat comes with everything you need to relax and enjoy a peaceful vacation. 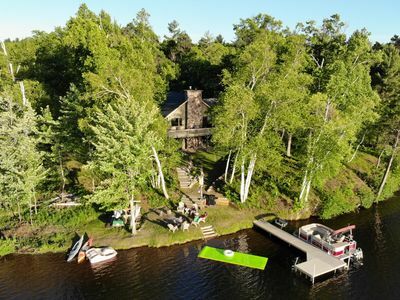 Included with the rental are ten watercraft (details below) and plenty of PFDs, an 18x6 foot Rubber Docky floating lily pad, a croquet set, bocce set, two 3-burner grills and a spare propane tank, along with ample firewood. You'll have everything you need to sit back and relax, you won't want to leave! 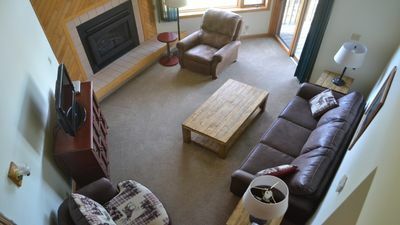 The layout of Gresham Retreat is ideal for large groups or multiple families, with two levels plus a private loft. 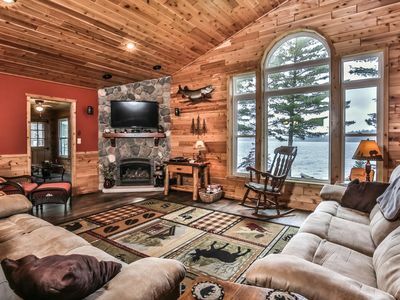 The main level boasts a great room that brings together a gas fireplace, kitchen, dining room, two story living room and lots of glass facing the lake and surrounding woods. 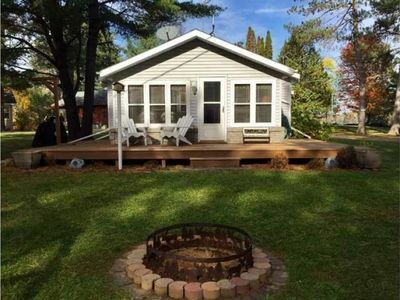 Two bedrooms and one full bath with shower and whirlpool tub finish out the main level. 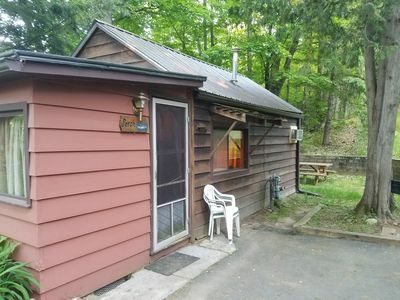 The lower level is a walk-out to the lake that includes a family room with rustic pool table, electronic dart board, laundry, one bedroom and one 3/4 bath with heated tile floor. Additional sleeping space is available in the enclosed loft area. 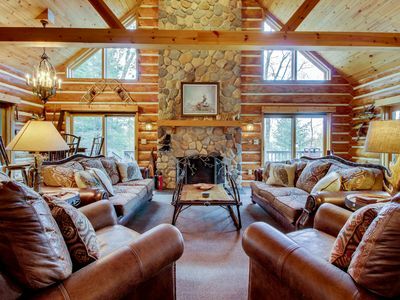 The interior is decorated with log furniture and up-north rustic decor. 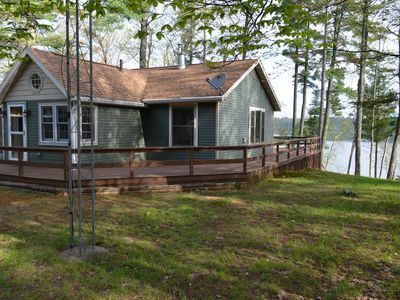 The large deck faces the lake and includes a patio set for 6 and a propane fire table (use may require refilling the propane tank in town). The rear deck off the kitchen includes a second propane grill, available year round. * YouTube HD TV provided by two 55" TVs, one on each level, with over 70 channels, more than 180 movies and dedicated children programming. * propane fire table on the deck is available during the late spring, summer and early fall months. Use may require refilling the propane tank in town. LOCATED ON LOWER GRESHAM LAKE: a 149-acre, clean and peaceful lake residential lake. Lower Gresham Lake is on a small chain connected by a stream navigable only by canoe or kayak and the home of many beavers, muskrat and otter. There's lots of water to explore and room to tube and ski, but the lake is small enough there isn't the noise of boat traffic. 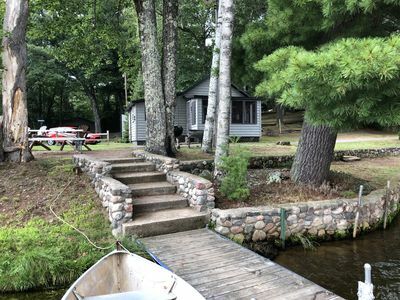 It is known for its loon families, eagle and heron nests, and great fishing for musky, largemouth bass and panfish, with other species including northern pike and walleye. 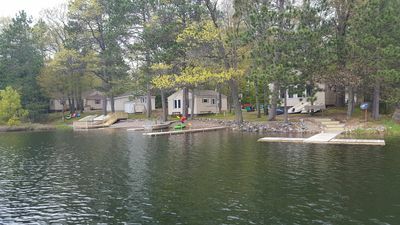 The lakefront, dock and firepit area allow you to soak in the views while the kids play or swim at the edge of the lake. Gresham Retreat has 520 feet of frontage on Lower Gresham Lake with a private sandy frontage and dock. 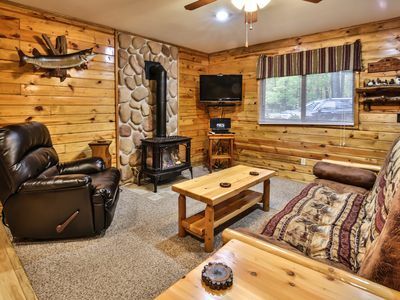 The surrounding area offers many great hunting and fishing opportunities as well as many hiking, cross-country ski, and direct access to the popular snowmobile trails. Wildlife commonly seen at Gresham Retreat include deer, mink, otters, muskrat, beaver, loons, and bald eagles. You may also get the chance to see a black bear or moose, who both frequent the area. Evenings are almost completely silent, filled with serene sunset views and only interrupted by the frog & loon calls, whip-or-wills and the occasional sounds of fish jumping, muskrats swimming by, or other wildlife. View and listen to some of the videos in the gallery or our site: greshamretreat.com for examples of the peaceful atmosphere that guests enjoy daily at Gresham Retreat! 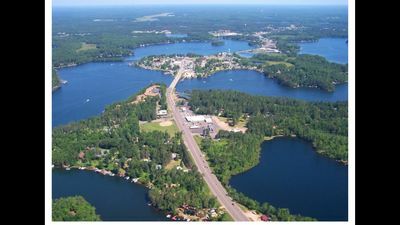 Lower Gresham Lake is only 15 minutes from the resort towns of Minocqua, Boulder Junction and Manitowish Waters, and less than 45 minutes from the U.P. for skiing and sightseeing, allowing you to have fun and then return to your peaceful getaway. For winter rentals, the North Lakeland Discovery Center just up the road has many groomed cross-country ski trails and Vilas county has 409 miles of groomed snowmobile trails. Gresham Retreat is only a half mile from cross country cruiser trail #51 at intersection #302, with direct access to the trails from an access trail attached to the driveway so you don't have to trailer your sleds to the trail. 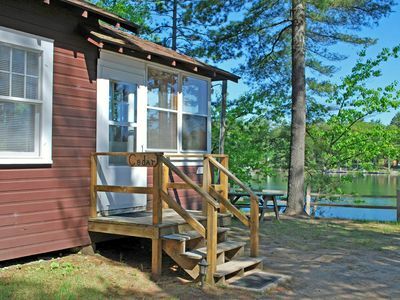 Little Muskie Retreat, Canoe included, on Little Muskie Lake! Snowmobile! 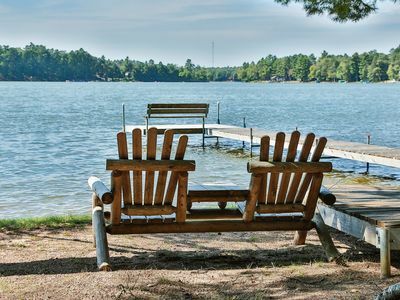 Downtown Condo on Lake Minocqua - Enjoy Many Onsite Amenities! Cottage 11 - Hiller's Pine Haven - Post Card views of every sunrise! 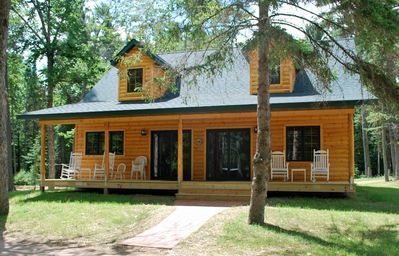 Hurley's Hideaway Resort: Bear's Den Cabin..same great resort, new listing!